Studies have shown that fruits and vegetables tend to lose both vitamins and minerals as they age. Don’t get me wrong, we should still be consuming a large variety of plants in our diet (the more local the better!). But when we add wild foods into our regular routine, we are adding another level of minerals and nutrients that we’re probably missing in our “non-wild” diet. Eating wild does not need to be hard or scary. In fact, it’s probably much easier than you might realize. And when you harvest it yourself, it’s not only extremely fresh, it’s FREE! There are so many wild foods available but my absolute favorite right now is Stinging Nettle. I’ve had a love for this plant since 2011 when I spent time on Susan Weed’s farm in Woodstock, NY apprenticing and learning about herbal medicine. Since then, I’ve been incorporating nettles into my life on a very regular basis. Now I grow it and have access to fresh nettles from Spring to Fall every year. So I’m finding new fun ways to experience the power of this plant. My personal experience with nettles has shown me that she provides energy and a deep nourishment. I simply just feel better, more clear and more energetic when I eat nettles or drink nettle tea. Because she grows wild, her roots go deeper into the soil, which means a more robust mineral profile. 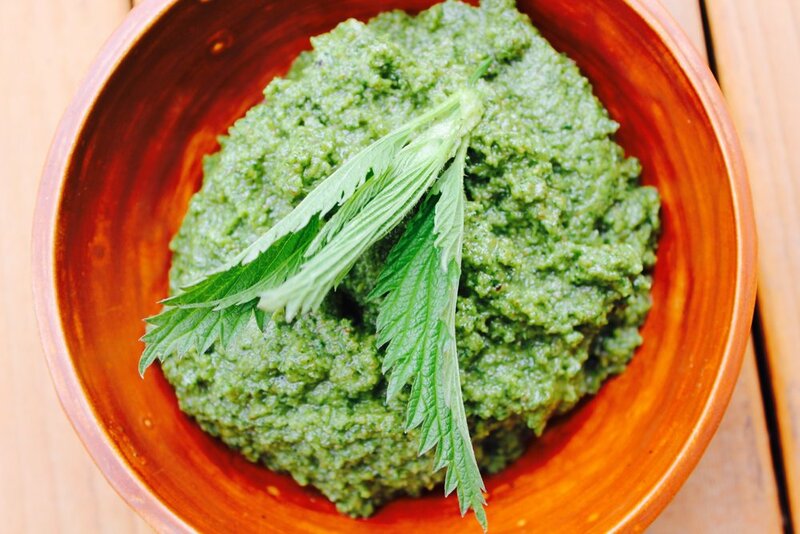 Nettles are extremely rich in minerals like calcium, magnesium and even protein. In fact, she’s one of the most nutrient-dense plants on the planet! You might have heard about nettles. They’re often called “Stinging Nettle” as noted above, and considered an unwanted weed! They can be found fresh growing in wooded areas. You can also purchase seeds and grow it yourself if you have the yard space (beware, it will take over). They get their name because they do in fact have stinging hairs along the stem and under the leaves. 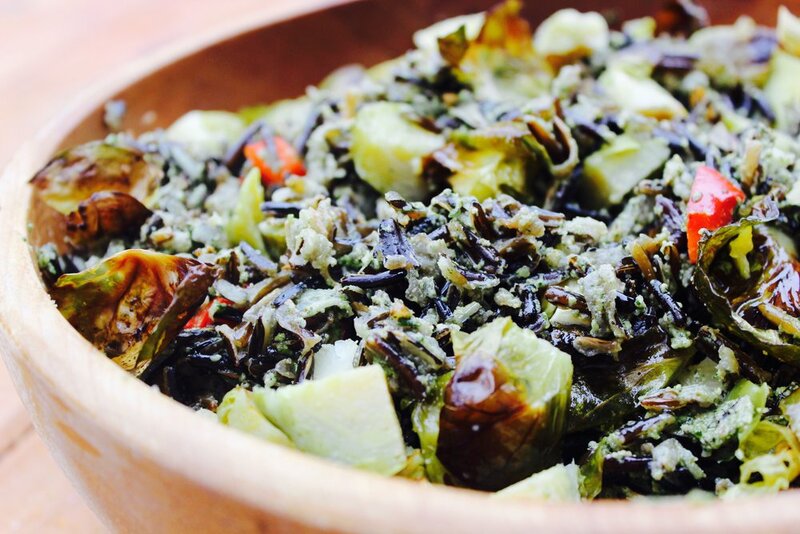 I’m also using black wild rice in the recipe I’m sharing with you today. This black rice is the most nutrient-dense of all the rice available. It’s extremely high in antioxidants, protects the heart and it’s naturally gluten-free. It’s also very nourishing to the adrenals, helping the body fight fatigue. This one is not quite as easy to harvest yourself in the wild, so look for it in your local health food store. It really just comes down to this: Wild foods mean more minerals, more nutrients and a higher level of well-being. Nettles are just one of many wild foods you can infuse into your diet. This is just a dip of the toe into an ocean of options out there. Have fun and get some wild onto your plate this season! Now onto the recipes. For video of me making these dishes and talking about the benefits of eating WILD, check out THIS LINK. To make your pesto, add your walnuts, sea salt, nutritional yeast and garlic and process until coarsely ground. Now add your nettle and rosemary and process again for a few seconds. As the processor is going, stream in your lemon juice and olive oil and watch as it becomes a beautiful emerald pesto before your eyes. My family absolutely adores this dish. It’s comforting, fresh and vibrant all at the same time. And it makes me feel so good knowing we are eating wild food that brings in a level of nourishment that supports our well-being on a higher level. To cook your wild rice, you want to first soak over-night if you can. Drain the water and then cook. To cook, add 1.5 cups water per cup of rice in your pot and allow it to come to a boil. Then reduce heat to medium low and allow to cook with the lid on. I like to add sea salt and fresh turmeric root to my rice as it cooks. When rice is cooking, sauté your ramps (or green onion) and Brussel sprouts in your olive oil and sea salt until tender. Don’t overcook – you want them to be nice and bright green. When rice is finished cooking, add your red pepper, ramps and broccoli and allow to sit. The red pepper will warm and soften with the heat. After a minute or so, add about ¼ cup of your pesto and stir until everything is coated. Serve with a sprinkle of hemp seeds and allow your cells to soak in the goodness. You can also check out videos of me making these recipes on our local IndyStyle show HERE. Sign up HERE to get your free plant-based recipe e-book of some of my favorite dishes and tips on how to create true health freedom.